The Northwest Spur is a regular magical mystery tour, with all sorts of fine problems, from snow aretes to cornices to ice cliffs to mixed climbing on the Triangle Face. 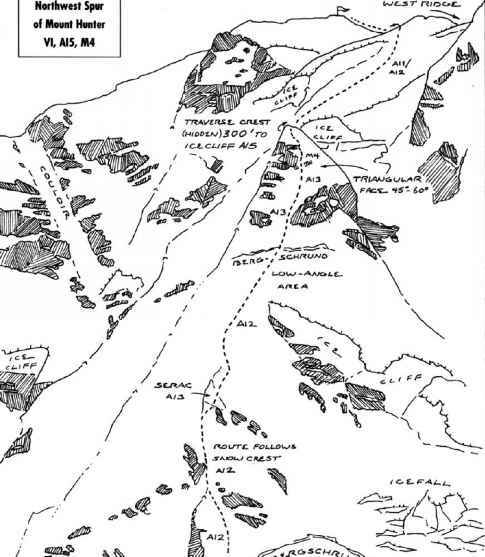 Although it is not particularly difficult in modern terms, it is the steepest of the major ridges on the north and west sides of Mount Hunter, rising directly above the "Kahiltna International" glacier landing strip, the jumping-off point for south-side Denali expeditions. It has been an obvious challenge for a couple of generations of climbers. A very fit twosome traveling without bivouac gear could make the round trip climb up and down from base camp to summit in a long Alaskan day, which would be a way to keep the commitment level on this climb very high. Most people will choose the more conservative compromise, however, of bringing adequate bivouac gear and food,- this will cause them to move slower and force them to make at least one or two bivouacs. In any case, the Northwest Spur offers thousands of feet of enjoyable, rapid movement on varied angles of ice and snow, with a few more difficult pitches to break up the rhythm. Location: Mount Hunter rises out of the southeast fork of the Kahiltna Glacier (the normal landing site for west- and south-side Denali climbs) in the Alaska Range. Comments: The Northwest Spur of Mount Hunter is technically the easiest of the climbs highlighted in this book. It is still a big Alaskan route, though, with all the attendant hazards of avalanches, cornices, storms, and route finding, which maintain the climbing interest and challenge. 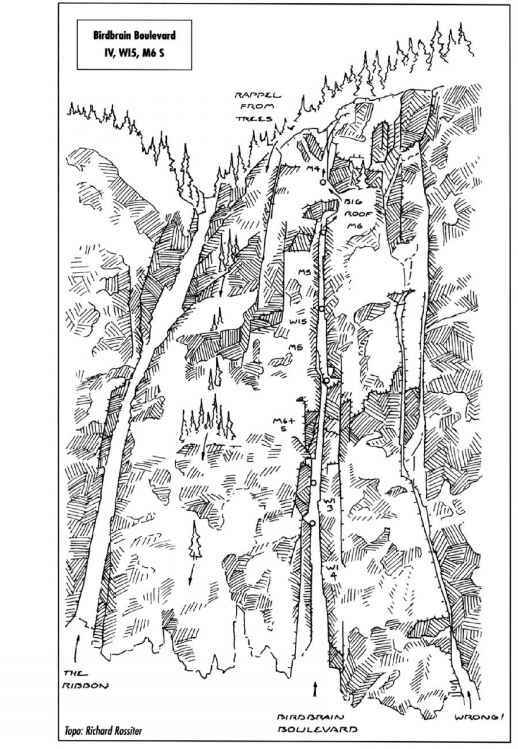 If you want a state-of-the-art modern climb, do the North Buttress, or the slightly easier Moonflower Buttress variation, on the rocky pillar three-quarters of a mile further to the left of the Northwest Spur. Approach: Fly from Talkeetna (50 miles away,- flying time, 30 minutes), or drive to Petersville and ski or snowshoe up the Kahiltna Glacier for 5 or 6 days to reach the southeast fork. Descent: Follow the West Ridge route down to the Kahiltna Glacier and walk the 3 or 4 miles around to the landing site on the southeast fork. The trickiest route finding on this descent occurs after you have come down from about 14,000 feet to the point where the summit ice cap meets the West Ridge. 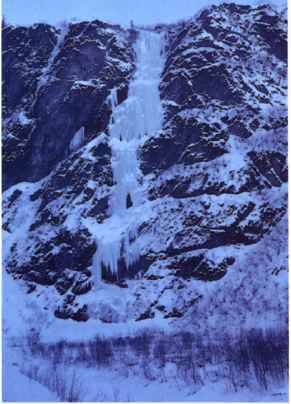 (This is a narrow spot with huge ice cliffs on either side and is very hard to locate in a whiteout. Therefore it might be worth taking bearings and distances from a map at the summit before descending.) At any rate, once you have gotten onto the ridge, follow it all the long way down to the glacier. This main ridge runs almost due west,-care should be taken not to accidentally follow one of the sub-ridges in another direction, The descent is extremely long and requires considerable moderate down-climbing and care in dealing with cornices.